Dhanbad, the Coal Capital of India is rich in art and culture. 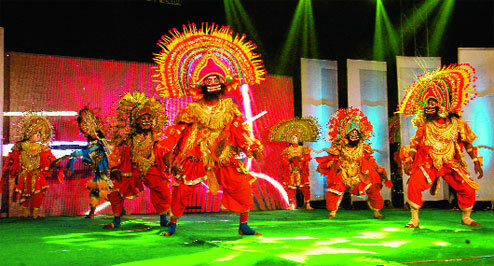 Dhanbad Mahotsav is the perfect example of vibrant culture of Dhanbad. A three day cultural event was held at the Birsa Munda Park from 31st January to 2nd February 2014. Dhanbad Mahotsav is the chromatic medium to showcase art and culture of Dhanbad. At times it also played unique role in promoting Birsa Munda Park on large scale as a tourist spot. Dhanbad Mahotsav is the brainchild of Deputy Commissioner of Dhanbad, Prashant Kumar. The cultural extravaganza was organized by Birsa Munda Park Samiti and Dhanbad Zilla Sanskritik and Krida Parishad and the main objective behind organizing this festival was the promotion of Dhanbad as a tourist hub. This festival was hosted with aim to provide a proper platform to Budding artists and cultural groups of the district to showcase their talent. Along with several cultural performances many other events also took place in this gala event like flower show, vegetable and fruit salad making competition, painting competition, blood donation camp etc. Dhanbad Mahotsav was held at Birsa Munda Park, the famous amusement park in Dhanbad city. This park boasts of being the alone amusement park in the entire region and is well known for its natural beauty and specialty of attracting people from all age groups. This amusement park offers numbers of recreational activities and has something special for everyone. Thus, it is one of the most famous picnic and tourist spots in Dhanbad. Dhanbad Mahotsav started with great pomp and show followed by non-ending fun and frolic for three days. On the first day, drawing competition was held in the open air theatre and flower show was also held which was the amazing one. Birsa Munda Park echoed with loud cheers when ‘Spandan’, the famous Manaitand based rock band performed on the opening day of Dhanbad Mahotsav. Chhau dance drama was the unique traditional performance in the memorable evening of the first day of this cultural fest. Indian Idol fame singers Abhishek and Puja Chaterjee also gave fantastic performance leaving audience asking for once more. Second day saw the enthralling performance by Mamata Shankar Ballet group which added an extra glam to this cultural extravaganza. The last day was the special one with the most awaited performance of famous singer, K.K. which was the major performance of this event. And patriotic movies were also screened in the all three evenings during this fun filled cultural fest. Apart from that blood donation camp was also held which encouraged people for taking a kind step towards a social cause. Visitors also enjoyed painting competition and the interesting vegetable and fruit salad making competition during Dhanbad Mahotsav which became special one of the memorable cultural events in Dhanbad.